"Tourists" have been visiting Le Puy en Velay for over a thousand years. The first European "tourists" were pilgrims; and it was in Le Puy en Velay that many of the early pilgrims gathered for the start of the arduous journey to the shrine of Santiago de Compostella, the great medieval pilgrimage destination in Galicia, Spain. The first pilgrimages set out from Le Puy in the late tenth century, and during the Middle Ages, the city became a major religious centre, the great starting point for one of the major Compostella pilgrimage routes, the Via Podiensis. It was in the cathedral at Le Puy, in 1095, that Pope Urban II announced the preparation of the First Crusade. While the idea of trekking to Santiago faded away for centuries after the Middle Ages, becoming a task only to be under taken by the very devoted or (fool)hardy, it is now well back in fashion. Today, Le Puy has returned to its important position as the starting point for the greatest European pilgrimage route, a hiking trail of over 1000 km undertaken each year, in whole or in part, by many thousands of pilgrims or hikers. But while le Puy attracts many hikers and pilgrims, preparing to set off for Compostella, or at least walk some of the trail, there is no need to be a hiker to visit this lovely small city. Le Puy boasts some remarkable historic monuments, and the cathedral area is classed as a UNESCO world heritage site. Located a few kilometres from the upper reaches of the River Loire, Le Puy - meaning "the Peak") grew up at the base of two substantial masses of basalt, cones of ancient volcanoes. On the smaller of these, 'l'Aiguilhe' (the needle), a small hermitage was built in the year 969. It is still there today, perhaps the most beautiful early medieval church in France. The only way to reach the chapel of Saint Michel de l'Aiguilhe is up 268 steps; but it's certainly worth the effort. Larger, but also only accessible up steps, is the twelfth century Cathédrale Notre Dame, one of the greatest and most distinctive Romanesque cathedrals in France. Due to its situation on the side of the "puy", the main entrance to the cathedral is in the basement, and visitors must then climb up stairs, to emerge in the middle of the cathedral. The cathedral of Le Puy is remarkable not just for its unusual configuration, but also for the Byzantine influence in its architecture. The plan of the cathedral is a Latin cross, and the nave is covered by domes, in the Byzantine style: but most remarkable is the oriental-style use of different coloured stones on the outside of the cathedral, as indeed also - and even more intricately - at the chapel of Saint Michel. The same intricate use of polychrome stonework can be seen in the cathedral cloisters, built in the 12th century, and certainly the most distinctive cloisters in France, if not in Europe. From a path winding up behind the cloisters, visitors can then climb up to the great iron statue of Notre Dame de France, erected in the year 1860 using the iron from 213 cannons captured during the siege of Sebastopol, in the Crimea. There is a magnificent view down over the roofs of the city. The old city of Le Puy is a delightful maze of small streets, flanked by tall houses painted in pastel colours. There are lots of small shops, antique shops and cafés, and visitors can also see lacemakers at work, le Puy having been famed for centuries as a centre for lace making. The tradition still survives to this day. Le Puy's Musée Crozatier museum has a substantial collection of 19th century French art and a large collection of artefacts and of geological interest. Le Puy is located about in the Massif Central mountains about 100 km southwest of Lyon, and 150 km south of Clermont Ferrand. Access By air Le Puy is not the easiest of French cities to get to. Le-Puy–Loudes airport has two flights a day (weekdays) to and from Paris Orly. Other than that, the best solution is to fly to Lyon Saint Exupéry airport, and take the train or hire a car. By train : From Paris or Lyon, take the TGV to Saint-Etienne, where there are connections by local train to Le Puy. The railway between Saint Etienne and Le Puy is slow but very scenic, following the Loire Gorge from just after Firminy as far as the outskirts of Le Puy. Le Puy can also be reached by local train from Clermont Ferrand; the route is also slow, but scenic. For timetables and online tickets, see Trainline.com . By road : Le Puy is located on the N88 trunk road which runs from Lyon to Toulouse. The N88 is mostly dual carriageway between Le Puy and Saint Etienne, where it joins the A47 motorway. 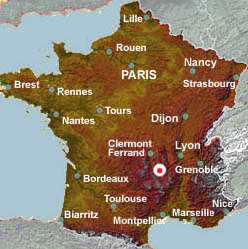 Le Puy also lies on the N102, linking Clermont-Ferrand and Montélimar. This is on part of the recommended no tolls route from northern France to Provence. Close to le Puy, and visible from the road to Clermont Ferrand, stands the mighty medieval fortress of Polignac, built on the top of a large volcanic outcrop. It is one of a number of castles in the area. The Loire gorges are very attractive, and offer opportunities for kayaking, fishing and swimming. Southeast of Le Puy are the Mont Mézenc and the Gerbier de Jonc, two volcanic peaks on the eastern flank of the Massif Central. From the tops of these, there are views over to the Alps on clear days. Northeast of le Puy, the small town of Brioude is one of the prettiest small towns in France, with a remarkable Romanesque basilica (three stars in the Michelin guide), and a new contemporary arts centre opening 2018. More generally, le Puy is surrounded by the uplands of the Auvergne region, an area with huge opportunities for outdoor activities of all kinds. Photo top of page : Photo above : For over a thousand years pilgrims have climbed the steps up to the Byzantine-style cathedral at Le Puy en Velay. Paris and Provence, via Clermont Ferrand. Main sites: The Cathedral, the Cathedral cloisters, Saint Michel de l'Aiguilhe, the statue of Notre Dame de France, the old city. Gorges de la Loire, Mont Mezenc.